In line with the revamp of the CICIVUS website, the CSIblog has been moved to the new CIVICUS domain and will now be found here: blogs.civicus.org/csi. Please visit us at our new home to keep up with what’s happening with theCSI!! April 29, 2011 – PSOin cooperation with CIVICUS has organized a seminar and workshop on the concept, relevance and use of the Civil Society Index (CSI). The day was attended by over forty key-staff from mostly PSOmember agencies. The relevance was clear from the reference that the Ministry of Foreign Affairs made to the CSIin their guidelines on monitoring and reporting for civil society organisations. In consultation with Partos, PSO took the initiative to invite key-staff of CIVICUS to the Netherlands and staged a seminar with representatives from government, private sector and civil society to reflect on the concept of civil society space. In three contributions each of the contributors gave their perspective on space for people, profit and power. 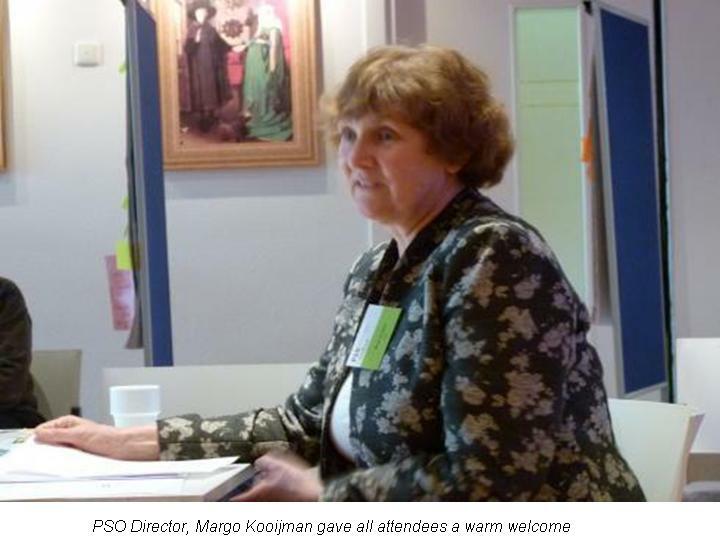 The seminar started with a welcome address by Margo Kooijman, Director ofPSO who welcomed CIVICUS as well as the active participation from thePSO membership and representatives of the Ministery of Foreign Affairs. The key-note address was delivered by Netsanet Demissie Belay, the Director of Policy and Research of CIVICUS, who gave an extensive update on the trends in civil society space and the international regulatory frameworks for civil society organisations. The evidence presented illustrates that despite current developments in the Middle East and Northern Africa, civil society space is still shrinking as it is suffering from securitization measures by governments legitimized by the fear of terrorist threats. CIVICUS is pleased to announce the publication of the Civil Society Index (CSI) Analytical Country Report from Guinea. The project was implanted in Guinea by the National Council for Civil Society Organisations in Guinea (CNOSGC), in partnership with the United Nations Development Programme (UNDP) and CIVICUS. The CSI scores suggest amongst other things that overall, Guinean citizens have a fairly weak level of engagement in civil society actions, and that levels of citizen participation in civil society and the associational life of Guinea remain relatively low. This is due, the report suggests, either to a lack of knowledge about the notion of civil society and its role, or a lack of technical and financial resources to enable citizens to actively meet societal needs. 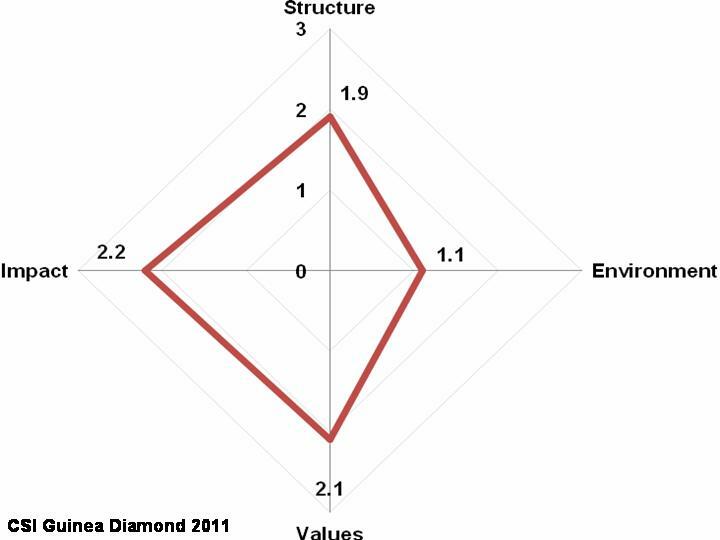 Meanwhile the external environment dimension, assessing Guinea’s political and legal context, had the lowest score. This suggests that the Guinean state, relying on its political, constitutional and economic power, does not create a favorable environment for the development of civil society. It is important to note that during the CSI research process, the change of regime that occurred in 2009 will likely further affect the extent to which the Guinean environment enables civil society. Some of the strengths of Guinean civil society highlighted in the report include the existence and diversity of CSOs, commitment by CSOs to their mandate to serve the vulnerable and poor, close proximity of CSOs to grassroots communities, and an effort to mainstream gender in programmes and policies. Weaknesses of civil society in Guinea include a poor understanding of the concept of civil society, political infiltration of some CSOs, low financial and human resource capacity, and an absence of self regulatory and transparency mechanisms. Suggested recommendations endorsed by a national workshop held in Conakry on 9 April 2011 include developing a new national civil society communication and information network; instigating and adopting a new code of ethics; initiating a new advocacy strategy for the greater involvement of civil society in the development, implementation, funding, monitoring and evaluation of government policies and of decentralisation. They also suggested that the CSI study should be repeated periodically in order to track and assess trends and the direction of change in Guinean civil society. CIVICUS is pleased to announce the publication of the Civil Society Index country report from Tanzania. The project was implemented in Tanzania by the Concern for Development Initiatives in Africa, ForDIA, with assistance from the United Nations Development Initiative (UNDP). The implication of the report is that Tanzania civil society is growing and developing and is performing fairly well, but not strongly. While the structure of civil society is assessed as over the halfway mark, Tanzania recorded low scores for levels of non-partisan political action and CSO membership. Levels of self-regulation and participation in umbrella CSOs are also ranked low. Other challenges identified include inadequate resources, CSOs being largely urban based, lack of democratic leadership, and political interference in civil society activities as well as a lack of skilled personnel in the sector. Strengths of the sector include the wide variety of CSOs covering a range of issues, promotion of joint advocacy efforts through umbrella organisations and political will from the government to recognise the activities of civil society. 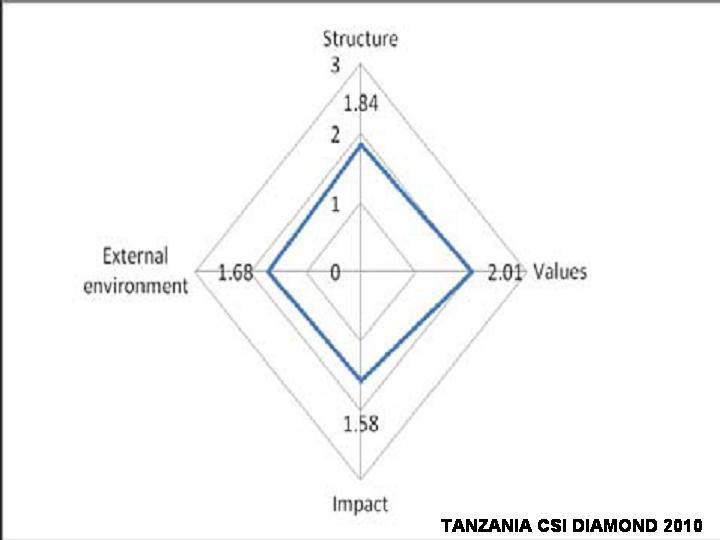 Following the publication of the report in Tanzania, four national task teams have been set up to address the four dimensions covered by the CSI analysis: structure, environment, values and impact. Each team has five members, charged with developing a work plan and implementation strategy to address the weaknesses identified in the CSI report. With constitutional review underway in Tanzania, this process of strengthening civil society collaboration instigated by the CSI findings is timely. CIVICUS is pleased to announce the publication of the Civil Society Index country report from Senegal. The project was implemented in Senegal by Forum Civil, with assistance from the United Nations Development Programme (UNDP). The report tells us that Senegalese civil society has strong values but a weak structure and the environment for its work are relatively weak. The study also shows that civil society has a noticeable impact on Senegalese democracy and the country’s development, but this too could be improved. Values of collectivity and collective action are part of Senegalese culture, and it is upon these values that civil society can build its forces. Senegalese civil society has contributed towards improving good governance in the public sector at national and local levels. It has been working to strengthen democracy, to build a law abiding state and to promote human rights. The generally recognised weaknesses of Senegalese CSOs are their lack of ability to plan, monitor financial management, sustain human resources and follow up their programmes and actions. Civil society promotes transparency but does not sufficiently practice what it preaches. Above all, CSOs have shown themselves little able to work in synergy on a long term basis in order to combine their forces and attack the problems of the Senegalese people. There are also weaknesses in the mobilisation of the population in the long term so as to ensure CSO impacts. Nevertheless, the report identifies that a new generation of civil society members is present today. This generation wants to play a role in the political context, the equal sharing of resources, prevention and handling of conflicts, instilling a law abiding state and enabling efficient citizen participation in managing affairs that affect their lives. Senegalese youth wishes to take its country’s destiny into its own hands, and it is notably very critical of leadership examples and the working of state structures, even of civil society structures. In the report discussed today, the most popular form of civic engagement proves to be sending SMS for a campaign. In addition, it appears that the citizens see the authentic voice of civil society through informal activist groups rather that the NGO. The main findings of the report were presented by Desislava Hristova, the National CSI Coordinator and her presentation can be found here. Assya Kavrakova, the Programme Director, commented on the changed environment for civil society in Bulgaria after the country’s accession into the European Union. She said that the civic sector has been marginalised from the reform agenda and new issues of financial instability have risen. The gap between CSOs and the citizens is significant and the CSOs are dependent on the state due to the altered way of financing. Her findings can be found here. The financial dependence of the sector on state funding also raises doubts of malpractice and corruption. This was said by Mr. Atanas Slavov, from the Institute for Direct Democracy, and he stated further that this mistrust in the state gives more legitimacy to NGOs, who should now consider effective ways to separate civil society from the state. Actions for genuine Democratic Alternatives AGENDA have launched the Civil Society Index CSI Report on Liberia. The CSI is a multi-dimensional action oriented research that a the Liberian Civil Society fewer than five dimensions: Civic Engagement, Level of organization, Practice of Value, perception of Impact, and External Environment. The research implores series of tools including; focus group discussion, three population surveys, external actions civil society, coupled with the desk review of civil society literature and a national workshop. The nine month project was funded by Trust Africa based in Dakar in Senegal, Humanity United based in California the USA, and CIVICUS- World Alliance based in South Africa. Guidance for the project came from a 20 member advisory committee which included members of Civil Society organizations, Private Sector, multinational organizations, international organizations and government agencies. The overall objectives o0f the Project was to establish an existence of an active and effective national and international platforms for knowledge based actions for strengthen of civil society. The launch which coincided with the third anniversary celebration of AGENDA took place at a dinner held at a local hotel in Monrovia and brought together a cross section of civil society actors, government representatives, the business community, and the media. 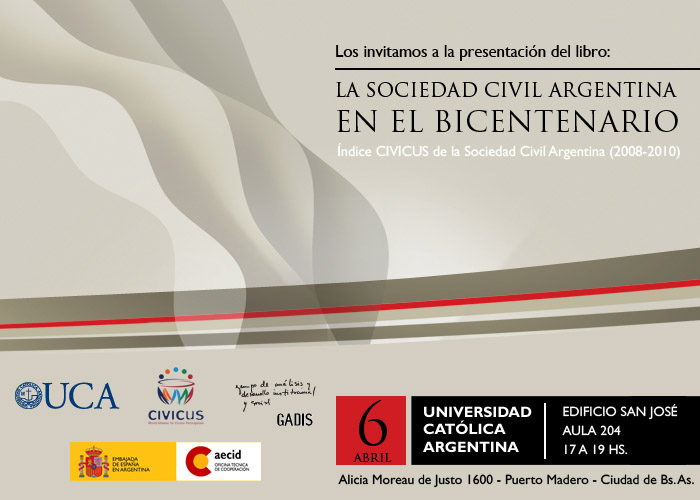 We are pleased to invite you to participate at the presentation of the book “The Civil Society in Argentina in the Bicentennial” on April 6th 2011 from 17:00 to 19:00. The book is a result of the implementation of the CIVICUS Civil Society Index in the country. The event will take place in the Hall Building 204 San Jose de la UCA (Alicia Moreau de Justo 1600). The study presents the knowledge of civil society in the country. lugar en el Aula 204 del Edificio San José de la UCA ( Alicia Moreau de Justo 1600 ) en el horario de 17 a 19 hs. que el estudio hace al conocimiento de la sociedad civil en el país. Se entregarán ejemplares de la publicación. • El contexto político, económico y sociocultural en el que la sociedad civil se desarrolla. El ISC es coordinado a nivel mundial por la organización internacional CIVICUS, Alianza Mundial para la Participación Ciudadana ( www.civicus.org ). En Argentina, el proyecto fue implementado por un consorcio conformado por la Asociación Civil GADIS y el Departamento de Sociología de la Universidad Católica Argentina. Agradecemos la difusión de esta invitación entre sus contactos. 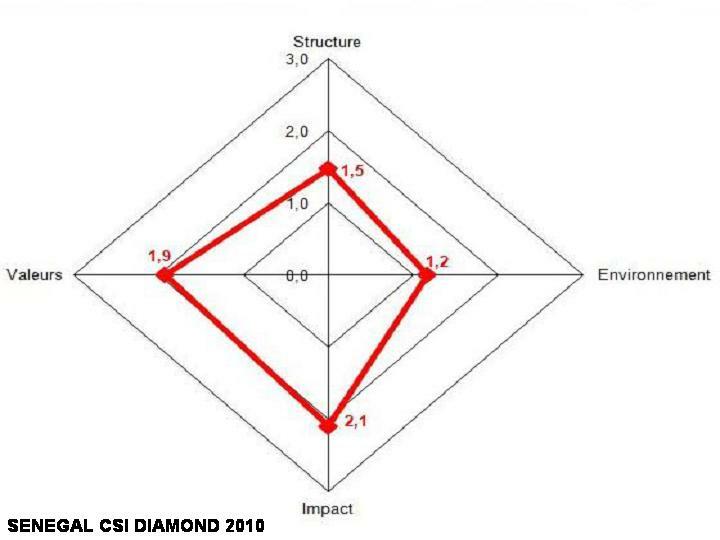 Compared to the past edition of CSI, the value of the perception of impact is lower and the value of the level of organisation dimension (which in the previous methodology was called structure) is higher. Since civil society in Italy has not changed in the last four years, we think that this difference is due to the difference in the methodology for collecting information in the two iterations: the first edition was mainly a collection of secondary data to which a group of experts gave an assessment, whilst in this edition such information mainly came from the opinions of a sample of CSOs. The results are in line with typical witnessed attitudes of Italian CSOs, which tend to over-estimate what they do internally and under- estimate the impact of their actions. This is a behaviour that also emerged during the past edition of the research. According to the results of this second edition, civil society in Italy is confirmed to be a mature and solid phenomenon. The weakness points that require the utmost attention, as they emerged from the research, seem to be the ability to influence the attitudes and values of Italian society in general; the inclusion and management of diversity; the attention to immigrants and their need to practice citizenship into civil society organizations; the commitment to emerging problems in Italy, such as social mobility and the rule of law, the increase of international links needed to face globalization effects; and, of course, the enhancement of the political impact, which the research confirmed to be inversely proportional to the social impact. Civil society in Italy is a mature and solid phenomenon, a permanent actor of the social, cultural, economic and political life of the country. Moreover it’s a phenomenon that enjoys of a favourable contest for its development. 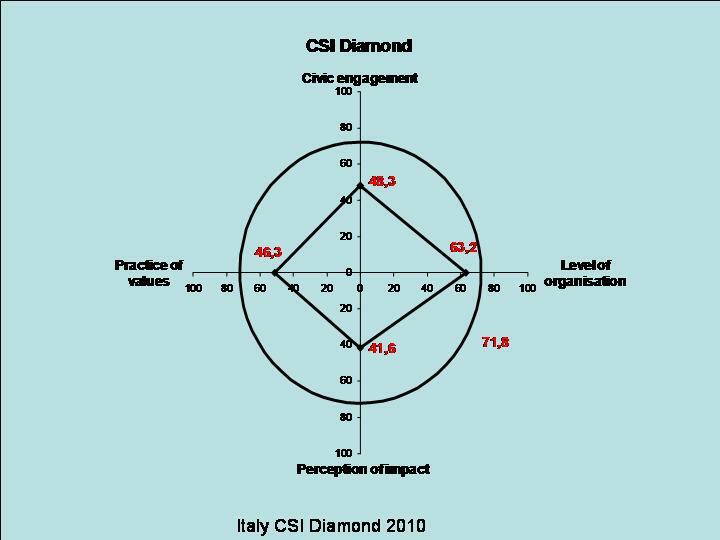 The values registered in each dimension are quite high and this evidence shows that Italian civil society has all the resources needed to solve the weaknesses highlighted in this research. 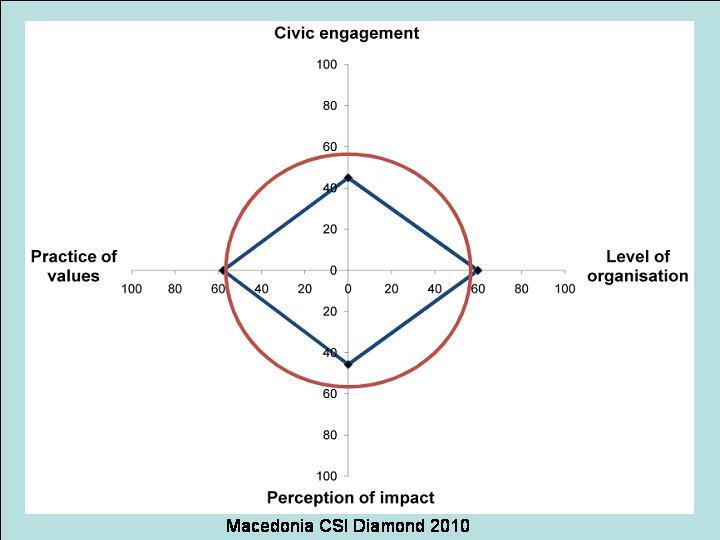 CIVICUS is pleased to announce the publication of the CSI Analytical Country Report from Macedonia, entitled Civic Engagement – Long Road to Go. The project was implemented in Macedonia by the Macedonian Center for International Cooperation (MCIC) with financial support from the Church Development Service (Evangelischer Entwicklungsdienst- EED) and the United Nations Development Programme (UNDP). MCIC decided to conduct CSI for a second time in Macedonia because of its utility not only for civil society, but also for other stakeholders. After five years of the first CSI, it is evident that CSOs used CSI as a self-assessment and evidence-based advocacy tool. CSI provides a base for strategy development, such as the working programme for 2006-2007 of the Civic Platform of Macedonia, and for creating public policies, such as the Strategy for Cooperation of the Government with the Civil Sector, adopted in 2007. By offering a comprehensive research methodology accompanied by actions it helps civil society to conduct further assessments and to share understanding of the context and state of civil society. The highest impacts of civil society are seen as empowering citizens and promoting policies for human rights and equality, with external stakeholders rating civil society’s impact as slightly higher than internal self-assessment. Members of civil society are, however, not setting strong examples in terms of tolerance, trust and public spiritedness. Only a small minority of citizens are engaged in CSOS, and no significant changes have been seen here in the last five years. Participation of citizens in informal activities to advance common interests is higher. As most groups of citizens are present in civil society, diversity is highly rated. The external environment for civil society is reasonable, but hindered by a state that is only partially effective, corruption in the public sector and a deep lack of public trust. As part of this, trust in civil society is low. More encouragingly, CSOs feel that the legal environment has improved in the last five years and that organisations are somewhat freer to do their work. Main strengths of Macedonian civil society identified by the study included its good influence over policies related to the protection of human rights and equality, decentralisation and the Ohrid Framework Agreement (which guarantees rights for Macedonia’s Albanian minority). Other strengths identified include capacity to empower citizens and meet societal needs, strong networking, communication and cooperation, and low levels of corruption, compared to the high levels of corruption in the public sector. CSOs also show they have capacity to raise funds from diverse sources, suggesting there may be a solid base for ensuring financial sustainability of civil society in future. Very limited impact on the main social problems in Macedonia – particularly poverty and unemployment – is one major weakness of Macedonian civil society, along with insufficient attempts to influence national budgetary processes. Limited involvement of citizens in civil society together with insufficient commitment of CSOs to their relations with members, citizens and other actors are another weak point, as are the lack of paid staff and civil society’s failure to act as a role model for trust, tolerance and public spiritedness. The report follows a previous 2006 CSI study, entitled After 15 years of transition – a country moving towards citizen participation. The underling idea at that time was that civil society was nearing the end of its period of stabilisation and that civil society should build on the success and seek to expand citizen participation (civic engagement). There were issues to be addressed to fulfil that objective including a need to respond to two crucial social concerns: combating poverty and corruption. Now, some years later in Macedonia, the Civil Society Index study provides an opportunity to explore the changes. 22.9% of citizens were members of CSOs in 2004, and six years later that figure was 24.7% (14.9% are members of at least one socially based CSO, and 25.4% are members of at least one political based CSO). The CSI report for Macedonia suggests that the country may indeed now have achieved the first step in increasing civic engagement – but that the building of long term participation and civic awareness among citizens represents just the first step on a long road to go.